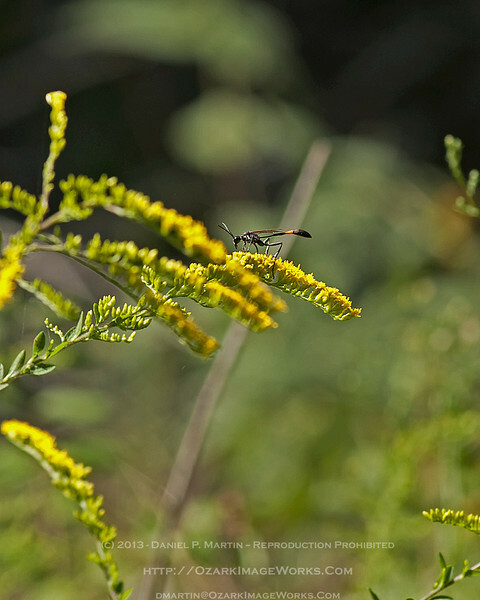 Another goldenrod flower, this time with one of the Ozarks native pollinators which feast on this plant: The common Thread Waisted Wasp (Ammophila procera). This wasp isn't just a pollinator - it's a hunter. Females are ground-nesting (the species is also sometimes referred to as "digger wasps"). They prey on other insects - caterpillars seem to be preferred - which they paralyze with their sting. After capturing their prey, the unlucky bugs are sealed up in the underground burrow... along with the wasps eggs. The prey become food for the next batch of wasps.